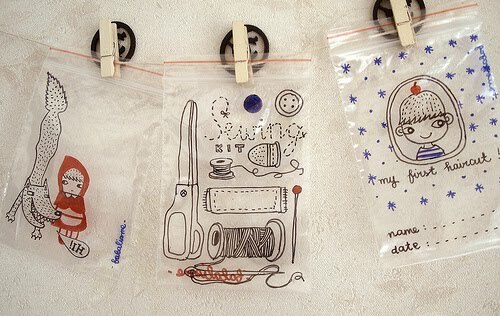 I stumbled on these little bags decorated by illustrator Babalisme and was so thoroughly charmed I had to share. Everyone! Go get a permanent marker and draw on your sandwich bags immediately. I plan to decorate my quart-sized baggie to impress fellow travelers in the security line at the airport. I think "Don't look in here" with a pretty border would be nice and attention-getting. P.S. I'm taking a blogging break over Memorial Day weekend. Back Tuesday! You have read this article with the title May 2010. You can bookmark this page URL http://jenkrebs.blogspot.com/2010/05/markers-plastic-bags-adorable.html. Thanks! You have read this article tutorials with the title May 2010. 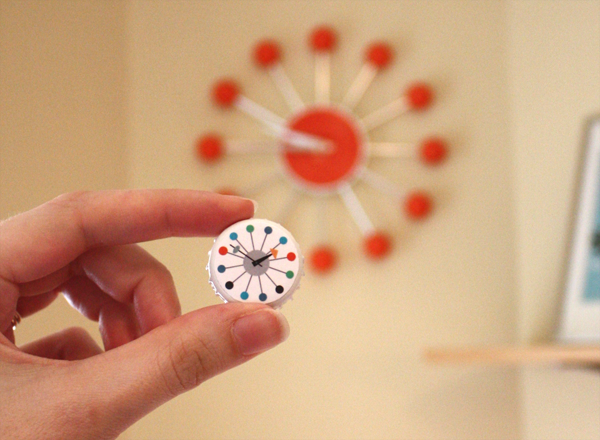 You can bookmark this page URL http://jenkrebs.blogspot.com/2010/05/diy-mid-century-clock-magnets.html. Thanks! Next time you want to pass on a recipe to a friend, try printing out recipe cards using Skip To My Lou's recipe card maker. Choose 4x6 or 3x5 card sizes and paste in your text. Long recipes won't fit on the card, though, so stick to shorter ones. It's probably for the best; your lazy friends like me will be glad. You have read this article printable / resources with the title May 2010. You can bookmark this page URL http://jenkrebs.blogspot.com/2010/05/printable-recipe-card-generator.html. Thanks! You have read this article home / sewing with the title May 2010. 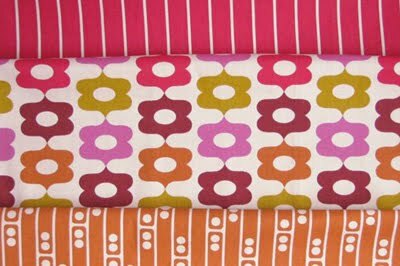 You can bookmark this page URL http://jenkrebs.blogspot.com/2010/05/pillow-sewing-spree.html. Thanks! If you like to grow things, perhaps you also like to paint things. 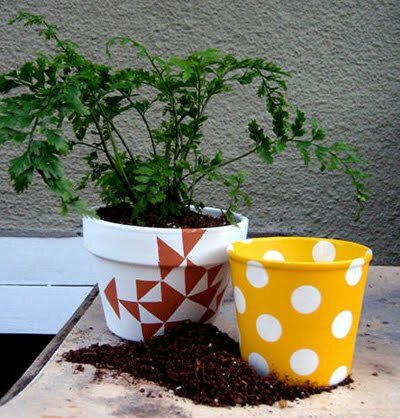 Check out Kate's painted plant pot tutorial on Design Sponge. 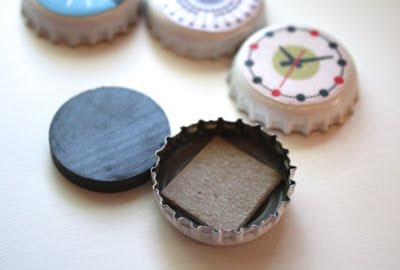 Tape, stickers, and spray paint make this a super easy DIY project. 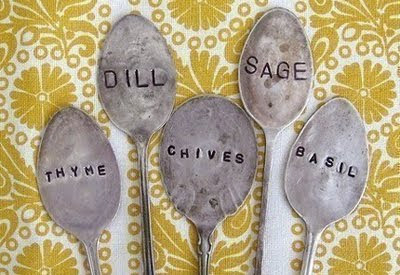 To make some garden markers from vintage spoons, get the how-to right here from Shrimp Salad Circus. 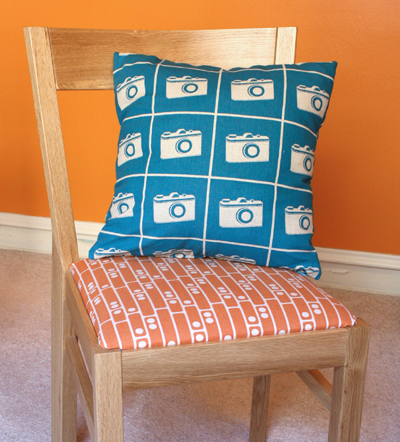 Or if that sounds like too much work, buy a set like this one from Hammermann on Etsy. 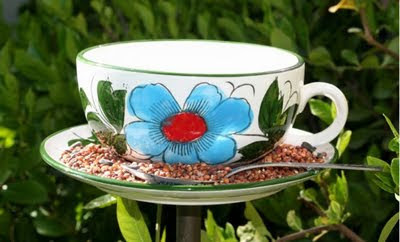 Make a tea cup bird feeder with instructions from Cap Creations. The saucer holds the seed and the cup holds the water. You have read this article tutorials with the title May 2010. You can bookmark this page URL http://jenkrebs.blogspot.com/2010/05/diy-projects-for-gardeners.html. Thanks! You never know when you might need some digital tartan. 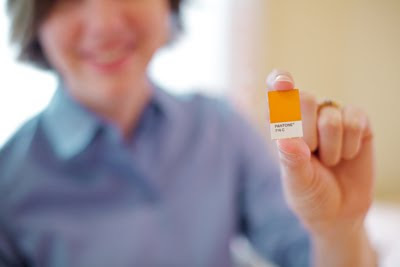 Customize your own weave and colors right here, then download a square to tile seamlessly. Make your Twitter page Scottish or take your website on a picnic. This is the traditional Jones clan tartan, above. You have read this article resources / time-wasters with the title May 2010. You can bookmark this page URL http://jenkrebs.blogspot.com/2010/05/make-your-own-plaid-background-patterns.html. Thanks! A friend told me about MyTomatoes.com yesterday. It's a site that utilizes the Pomodoro Technique, a time management method based on the theory that frequent breaks can improve mental agility. My favorite part: time is measured in 25 minute increments called "pomodoros," Italian for tomatoes. The idea is to work for 25 minutes until the timer goes off, record what you did, take a 5 minute break, and repeat. After every four tomatoes you finish, take a longer 15-20 minute break. I was all set to try it today, but work was too hectic to bother with setting the timer. This might be a good tool to use when you don't have immediate outside deadlines, and you struggle to stay focused and feel productive. You have read this article resources with the title May 2010. 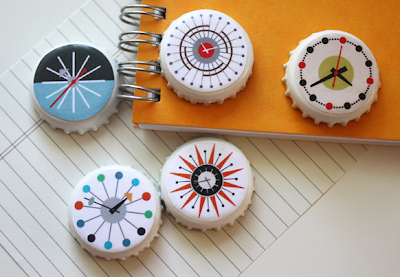 You can bookmark this page URL http://jenkrebs.blogspot.com/2010/05/time-management-help.html. Thanks! "What a fun project this was! As the chickens progressed, I would hold the pieces up, look at them and laugh because they were so cute and funny! The pattern was very well designed with easy-to-follow directions. As the instructions say: 'It is assumed that the sewer has basic to intermediate sewing experience, including knowing how to sew around curves, attach simple gusset-type pieces, sew darts and do top-stitching.' The pattern is not difficult, but I wouldn't choose it as a first project for a beginner sewer. I would also add that you need to know how to embroider just a bit. 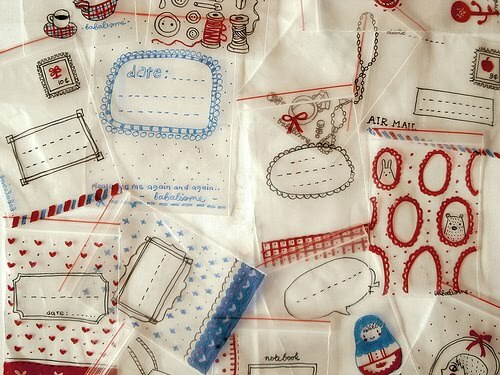 There are lots of tiny pieces to cut and sew around. They're not hard to work with, but they do require a little time and patience. 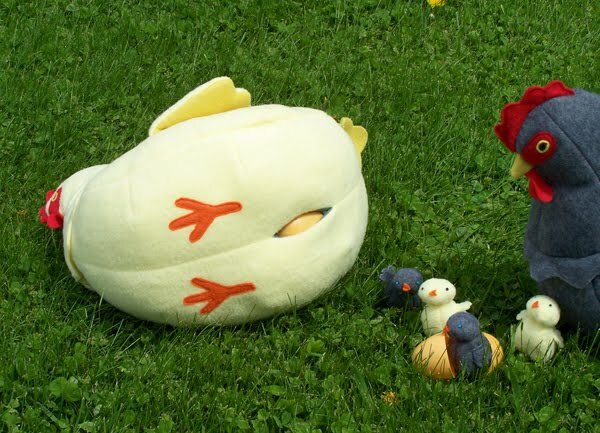 I found the hardest part was sewing the wattles into the beaks, and then turning the hen's beak right side out, because it was so small and the felt did not turn easily. I did then make the rooster's beak bigger... after all, roosters are bigger, right? I also changed a couple of things from the original pattern, mainly the placement of the face parts, just to look a bit more realistic, and I made a different tail and bigger comb for the rooster. I would certainly recommend this pattern. The fleece made for a soft, huggable chicken family, and my granddaughter loves them!" 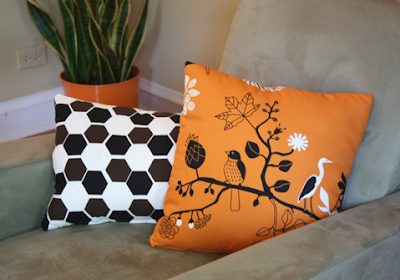 You have read this article pattern review / sewing with the title May 2010. 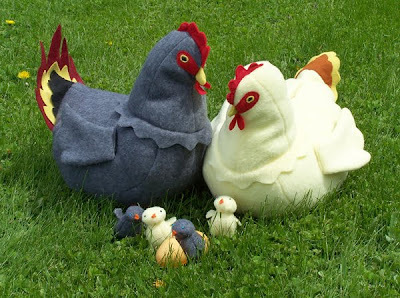 You can bookmark this page URL http://jenkrebs.blogspot.com/2010/05/pattern-review-chickens.html. Thanks! The advent of social media has created a new source of stress in our lives: the pressure to think up the perfect status update. Generatus.com to the rescue. "How many hours have you wasted trying to think of something suitably witty, funny and original for your status on Facebook or Twitter? Let's face it, a status like 'Dave is mowing the lawn' or 'Kate is asleep' is not going to impress that huge entourage of friends you've amassed." Right on. Get help now. You have read this article time-wasters with the title May 2010. You can bookmark this page URL http://jenkrebs.blogspot.com/2010/05/friday-fun-social-media-status-generator.html. Thanks! You have read this article bag / sewing / tutorials with the title May 2010. 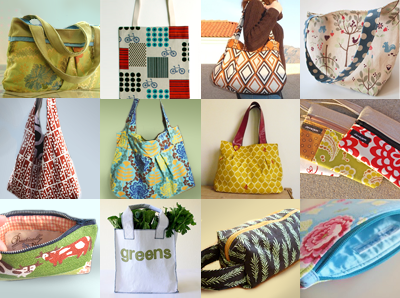 You can bookmark this page URL http://jenkrebs.blogspot.com/2010/05/12-free-bag-and-purse-tutorials.html. Thanks! Krista, a former marketing director in the world of modern furniture, runs a bakery near Berkeley. 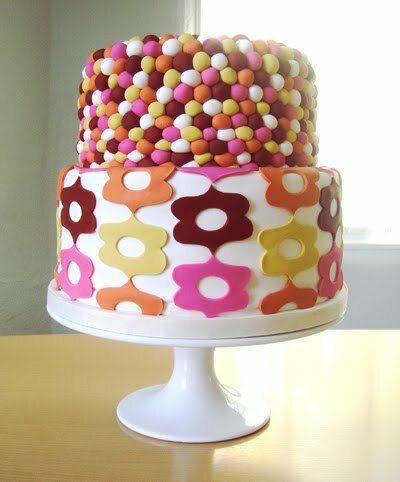 I just about fell off my chair when I saw the other amazing, graphic cakes she makes. Have a look! 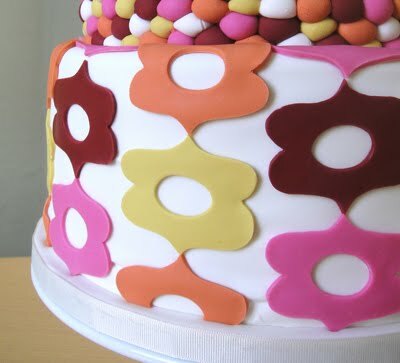 If you're a brave soul who would like to try making your own cake decorated with fondant, here's a tutorial from Make It and Love It in three parts: one, two, three. You have read this article random with the title May 2010. 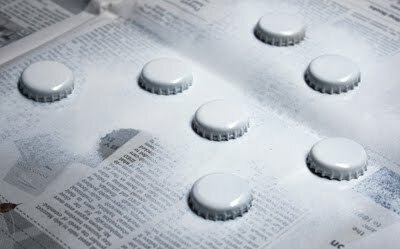 You can bookmark this page URL http://jenkrebs.blogspot.com/2010/05/sugarcoat-it-studio-modern-cakes.html. Thanks! Ruffles are everywhere. They're taking over the world like a growing fungus, feeding on every shirt and pillow and bag in their path. JCrew and Anthropologie have completely succumbed. Good thing ruffles are so darned pretty. If you'd like to invite some into your existing wardrobe, check out the following tutorials. 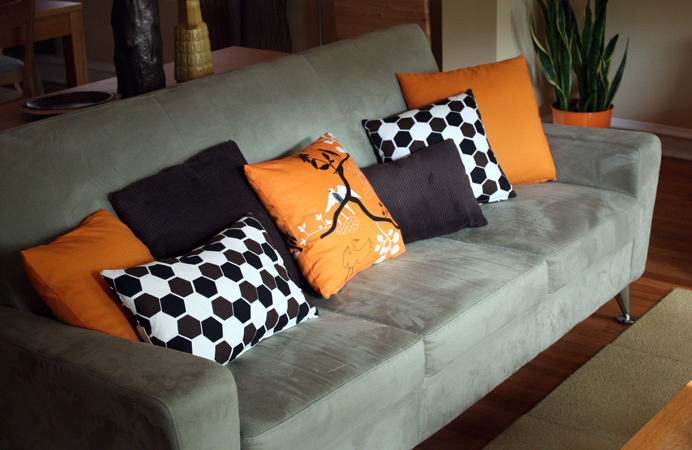 Most projects are made from refashioned t-shirts or jersey easily found at fabric stores. You have read this article sewing / tutorials with the title May 2010. 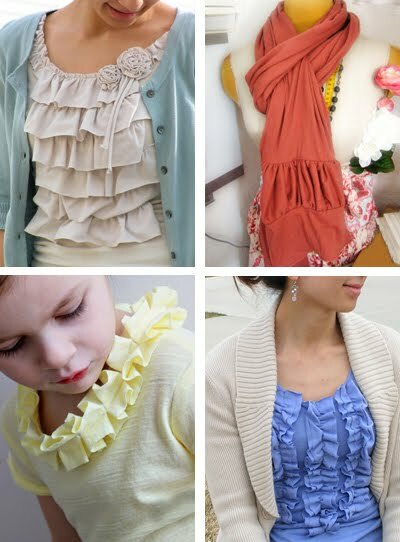 You can bookmark this page URL http://jenkrebs.blogspot.com/2010/05/diy-ruffled-t-shirt-tutorials-and-other.html. Thanks! Fans of typography, rejoice! 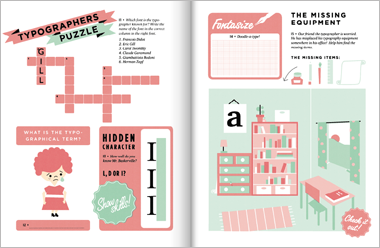 Hyperactivitypography from A to Z is an activity book filled with puzzles and games to test your type knowledge and learn new skills. It's clever and witty and adorable. Flip through it right here. The book is designed by Studio 3, a group of 15 third year graphic design students at Westerdals School of Communication in Oslo, Norway. You have read this article fonts / time-wasters with the title May 2010. 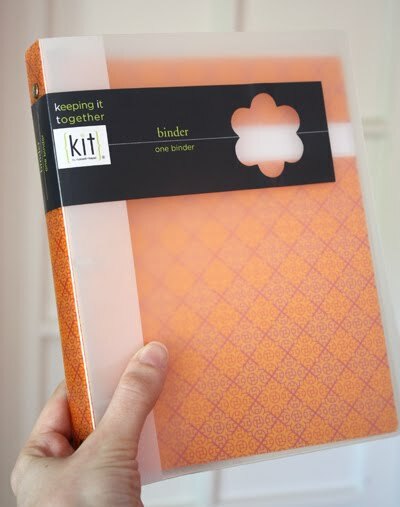 You can bookmark this page URL http://jenkrebs.blogspot.com/2010/05/activity-book-for-type-lovers.html. Thanks! 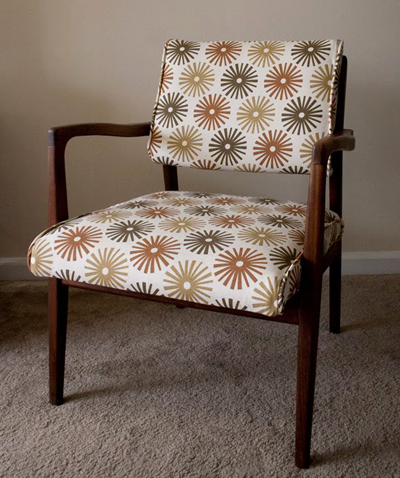 Blog reader Melissa Swanson sent me a photo of this chair makeover she performed with my Fireworks print. She should have kept that under wraps, because now I'm going to have to break into her house and steal it. You have read this article design work with the title May 2010. You can bookmark this page URL http://jenkrebs.blogspot.com/2010/05/a-thing-made-from-my-fabric.html. Thanks! 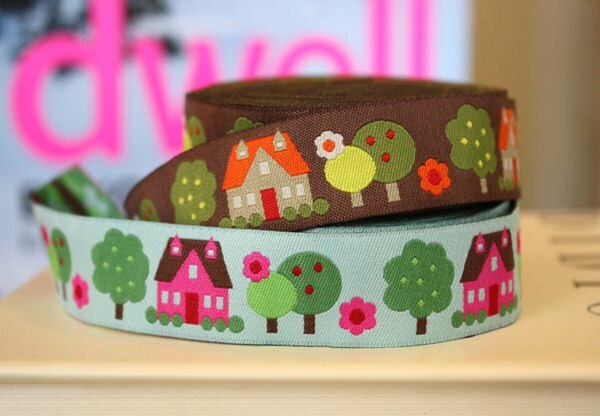 I just got samples of the latest ribbon I designed for J Caroline Designs. 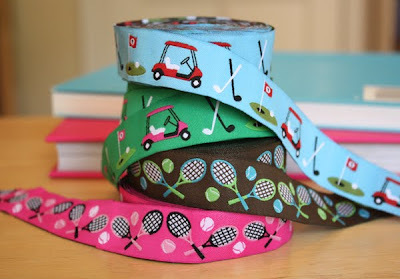 She commissioned me to do tennis and golf ribbon. So I made her houses instead. Ha! Take that, Caroline. I did also make the requested sports ribbon. But really? Do people wrap the handles of their tennis racquets with this stuff? How could it possibly be used? I'll keep my eye out for it at Wimbledon. Or maybe Tiger Woods could trim his shirts with the golf version, and the press would be so bewildered that they'd finally start writing articles about him on a new topic. 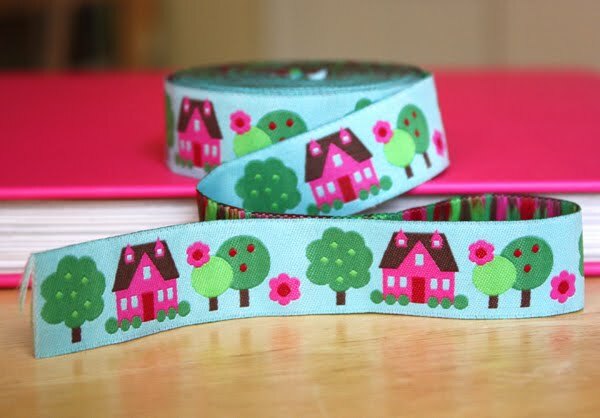 And what to do with houses... maybe wrap a cute housewarming present with it. Yes. To purchase some, you could either buy it by the yard here at Fat Quarter Shop, or get 25-yard rolls (a super deal) for reselling or for trimming lots of shirts for Tiger right here at J Caroline Creative. More designs coming soon! You have read this article design work with the title May 2010. You can bookmark this page URL http://jenkrebs.blogspot.com/2010/05/new-ribbon-designs.html. Thanks! You have read this article downloads / printable with the title May 2010. You can bookmark this page URL http://jenkrebs.blogspot.com/2010/05/printable-bookplate-freebie.html. Thanks! You have read this article favorite things with the title May 2010. You can bookmark this page URL http://jenkrebs.blogspot.com/2010/05/russell-hazel-for-target.html. Thanks! You have read this article random with the title May 2010. You can bookmark this page URL http://jenkrebs.blogspot.com/2010/05/chicago-photographer-simply-jessie-came.html. Thanks!